Everyone's Wearing Dad Jackets—What Does This Mean? Blame Drake. Blame Balenciaga. Blame the A-list. Wherever you look, the "dad jacket" is everywhere right now, and with the colder weather coming in, we predict it's only going to become more mainstream. It's not just runway designers who have managed to up the ante on this unexpected item—high-street stores such as Reformation and Topshop are also carrying plenty of them. But perhaps we should explain a little bit about the trend first, as that might just persuade you into it. The dad jacket trend includes outerwear pieces such as the old-school bomber (but only in black or khaki; none of this floral stuff, thank you very much), the puffer, and the cagoule. Now, you might be thinking that you've already got the first style and are considering the second, but the third? Yeah, we can see why you'd be against this. Hear us out. 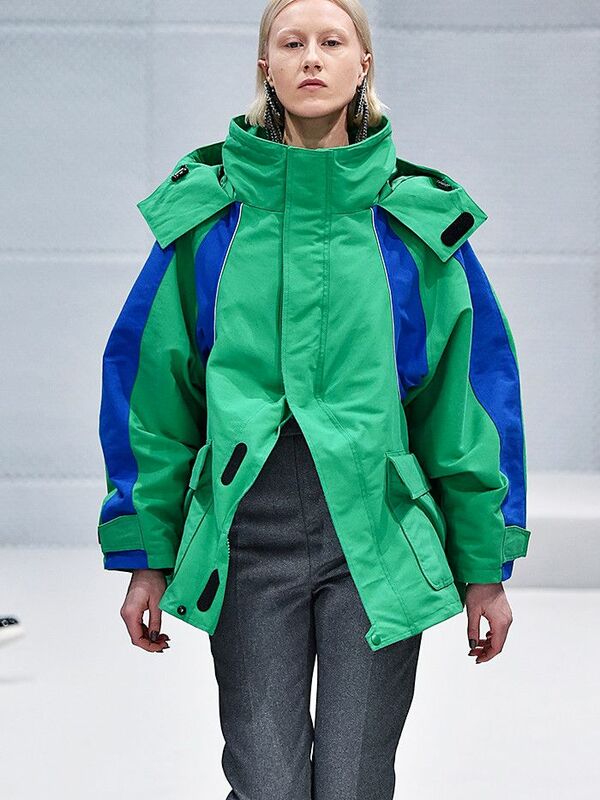 The biggest case for this look is from Balenciaga's A/W 16 catwalk, which proved that the humble waterproof jacket can be super stylish—it's just all in how you wear it, of course. When opting for an all-terrain haute cagoule, the trick is to either wear it hanging off both shoulders or zipped up to the top, with it open at the bottom. As for the bomber and the puffer, we imagine you've already managed to nail these looks, but if you really want to do this season's way of sporting the trend, we suggest that a bomber in black is the best way to rock a dad look. As for the puffer, opt for one in any colour; just make sure to have it hanging off your shoulders for the full effect. Click through our gallery to see the dad jacket in action and find out where to shop some of our favourite pieces right now. Style Notes: Zip up the jacket to the top, and leave it open at the bottom. Style Notes: Another option for styling your waterproof jacket is to leave it wide open at the top. Style Notes: The red puffer jacket that everyone wants to wear right now. Style Notes: For a slightly longer cagoule, try opening the top and bottom. Style Notes: Perfect for colder weather, no? Style Notes: This dad jacket looks great over a pair of skinnies and cropped tank top. This one's chic but easy on the purse. Go full-on dad jacket with this North Face version. We predict big things for this mustard/gold colour. An investment piece, but totally worth it. This Reformation and Patagonia collab would persuade anyone to try the dad jacket trend. A black bomber to do the trend in a more subtle way. This look not for you? Shop more outerwear options from this season with our 31 best winter coats that tick off every important trend.